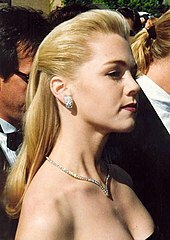 In 1990, she landed the role of Kelly Taylor in the series Beverly Hills, 90210. Throughout the series, Garth's character went through several trials and tribulations, and dealt with difficult issues in her personal life and with her family. Garth appears in all ten seasons of the show. She directed two episodes which was the second most of any cast member. She won a Young Artist Award and was nominated for a Teen Choice Award for the role. She was also instrumental in launching the spin-offs Melrose Place and 90210, with the character of Kelly becoming a continuity icon by appearing in the most franchise episodes. Her successful role on Beverly Hills, 90210 opened the door to several lead roles in made-for-TV films in the 1990s, including Danielle Steel's Star (1993), Without Consent (1994), Lies of the Heart: The Story of Laurie Kellogg (1994), Falling for You (1995), and An Unfinished Affair (1996). She also had minor and supporting roles in the theatrical films Telling You (1998), My Brother's War (1997), and Power 98 (1996). Garth ranked No. 59 on the FHM 100 Sexiest Women of 2000, and #93 on the magazine's 100 Sexiest Women of 2001. In 2002, Garth co-starred with Amanda Bynes in the WB sitcom What I Like About You as Valerie Tyler. She and Bynes appeared on the show for all four seasons. The show centered around the relationship of the Tyler sisters, along with their friendships and romances. In 2003, she starred in the television movies The Last Cowboy and the Christmas family drama Secret Santa, playing a journalist. She and the cast of Secret Santa won the 2004 CAMIE Award. In 2005, she voiced her Beverly Hills, 90210 character Kelly Taylor, as well as an additional role in the DVD Film Family Guy Presents Stewie Griffin: The Untold Story. The ensemble cast included Seth MacFarlane, Alex Borstein, Mila Kunis, and Drew Barrymore. Garth also starred in the TV teen drama film Girl, Positive (2007), playing a teacher who was HIV positive. She and co-star Andrea Bowen (known for the series Desperate Housewives) each won a Prism Award for their performances. In 2007, Garth appeared on Dancing with the Stars: season five and was paired with Derek Hough. They reached the semi-finals in the competition. In September 2008, Garth returned to the role of Kelly Taylor on the series premiere of The CW's spin-off series 90210. In the new series, Garth's character, Kelly Taylor, is a Guidance Counselor at the fictional West Beverly High, where her half-sister Erin Silver attends. Kelly was reintroduced with a four-year-old son, whose father is ex-boyfriend Dylan McKay. The writers were eager to have her share scenes with former Beverly Hills, 90210 co-star Shannen Doherty, who reprised her role of Brenda Walsh. Tori Spelling, who played Donna Martin in the original series, later joined the spinoff in a recurring role as well. Garth also reprised the role in season two. On November 21, 2008, Garth appeared on the game show Are You Smarter than a 5th Grader?. She won $100,000 for her charity, the American Heart Association, for which she is spokeswoman for its "Go Red for Women" campaign. This TV show also noted that Garth owns a horse ranch in Santa Barbara, California. In 2009, she played the role of Natasha in Candace Bushnell's Web series of The Boardroom. She also appeared in a cameo role on the December 7 episode of the children's television show Sesame Street, entitled "Mary Mary Quite Contrary". In January 2010, Garth starred in an iVillage web series created by NBC Universal, Garden Party, about farm life, fresh produce and healthy eating. On February 18, 2014, it was announced that production had started on The Jennie Garth Project, a ten-episode reality television series that will air on HGTV. It chronicles Garth as she renovates a home in Hollywood Hills, California for herself and her three children. On May 3, 2017, Garth launched MomGiftBox.com, "an online subscription box of products to indulge, inspire and pamper moms with every purchase benefiting a charity." Garth was married to musician Daniel B. Clark from 1994 to 1996. In 1995, Garth met her second husband, actor Peter Facinelli, while filming the movie An Unfinished Affair. Garth and Facinelli married on January 20, 2001, in a traditional Roman Catholic ceremony. They have three daughters; Luca Bella (b. 1997), Lola Ray (b. 2002), and Fiona Eve (b. 2006). In March 2012, Facinelli filed for divorce. The divorce was finalized in June 2013. Although there was no requirement to do so, Garth had converted to Catholicism when she married Facinelli. Garth subsequently began dating actor David Abrams in the fall of 2014 after they met on a blind date, and they became engaged in April 2015. They married on July 11, 2015. Garth and Abrams separated in 2017. In April 2018, the couple filed for divorce. In February 2019 the couple appeared to have reconciled with Abrams filing a petition to dismiss the divorce proceedings. In 2002, Garth was diagnosed with a leaky heart valve, a condition which she stated would require monitoring for the rest of her life. She revealed the diagnosis in 2009. "Down the road it’s something that could get more complicated or it could not," she commented. "People have had valve replacements and that kind of thing … but I’m prepared, that’s the key." 1989 Growing Pains Denise Episode: "Ben and Mike's Excellent Adventure"
The Larry Sanders Show herself Episode: "Larry's Sitcom"
Biker Mice from Mars Angel Revson (voice) Episode: "Hit the Road, Jack"
2006 American Dad! Trudy Lawrence (voice) Episode: "Roger n' Me"
2013 Community Ensign Episode: "Conventions of Space and Time"
Robot Chicken Marie-Grace Gardner, Carol Brady (voice) Episode: "Secret of the Flushed Footlong"
2018 The Mick herself Episode: "The Climb"
In 2007, Garth appeared on season five of Dancing with the Stars and was paired with Derek Hough. They reached the semi-finals in the competition. 6 Mambo / "Mambo Baby"
7 Viennese Waltz / "Runaway"
8 Jive / "It Takes Two"
Semi-finals Tango/"The Take Over, The Breaks Over"